INNOVATION DOESN'T ALWAYS BRING RECOGNITION, STILL LESS ACCLAIM - BUT DAVID DUNSTAN'S ROTARY-VALVE HOLDEN MOTOR IS A JEWEL OF AUTOMOTIVE ENGINEERING. 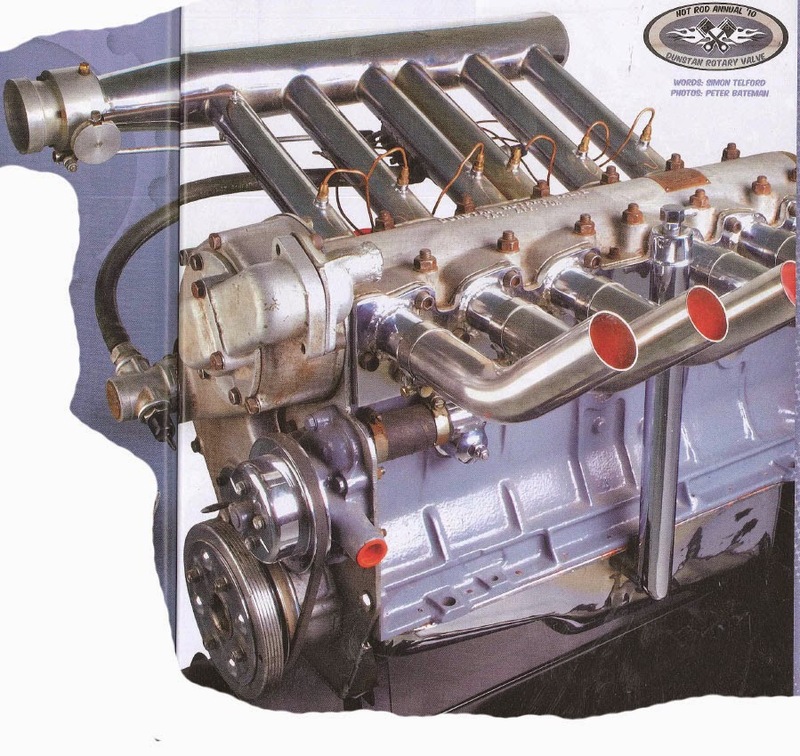 Of all the automotive engines manufactured in Australia, to this day none has received such intense after-market development as the venerable Holden grey six. With its modest size and power just 60hp at 3800rpm from the 132ci on debut it 1948 — the grey doesn’t sound like much of a bargain in 2010. However, the sideplate six was not only readily available, it was also very responsive to modification and, apart from pm the four-main-bearing design, generally quite stout in terms of rods, pistons and valve train. And that made it immensely popular for circuit, drag speedway and marine racing. Competition improves the breed and the aftermarket developed everything from mufti-cab inlet manifolds, cams and pistons, to wiId crossflow, twin-cam and widest of a I rotary valve heads. This last was covoiopcd by South Australian engineer David Dunstan it the late 1950s and it remains the most sought-after and mythical of all the grey- motor hop up gear in existence. If you are wondering what the heck a -Wavy-wake head is well, you're already familiar with the basic concept, because your everyday bathroom tap is a type of rotary valve. Dunstan shows how the valve and the combustion chamber insert mate under spring and compression pressure. Changing valve timing involved fling the port edges. Where a normal piston engine uses reciprocating poppet valves, the Dunstan Rotary Valve engine (DKV) did away with the factory head, pushrods, camshaft, tappets and valves and replaced them with a two-piece head, the major feature of which was a deep trough along the top, parallel with the line of the crankshaft, which carried the rotary valve This hollow (so coolant could pass through it), log-type valve turned at one-quarter of engine speed. It had slots machined into it that opened and shut across the ports. Each cylinder had two intake passages or pockets, 180 degrees apart on opposite sides of the valve. Both intake and exhaust gases use the same valve port in alternation. Floating plates sealed the combustion chambers to the valve. And the advantages of all that? Much-improved breathing (one of the Holden's Achilles heels), and a minimum of reciprocating parts with massive rpm potential. A DRV designed with a normal distributor and custom timing cover for automotive use. Dunstan intended a single stromberg to replace his fuel injection for normal road use. 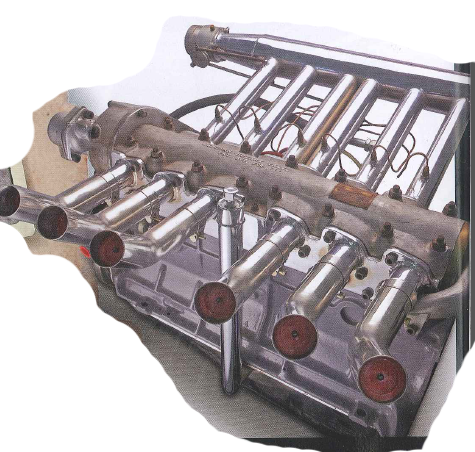 The complete rotary-valve conversion laid out for September 1957 issue of Wheels - the valve itself can be seen laying in place on the top half of the split cylinder head. Dunstan didn't invent the rotary valve, which dates back to the years before WWI when several manufacturers used the design, including Itala, whose four-cylinder, eight-litre beast for the 1913 French Grand Prix employed rotary valves. Many engineers toyed with the concept for both cars and bikes, including Australian HS McLaren, who submitted a rotary-valve engine concept to GMH while Dunstan was working there during WWII. The two inventors became friends and Dunstan was inspired to come up with his own variation on the concept, which he was able to put into production via the Southcott engineering firm for which he worked after the war. Many engineers toyed with the concept for both cars and bikes, including Australian HS McLaren, who submitted a rotary-valve engine concept to GMH while Dunstan was working there during WWII. The two inventors became friends and Dunstan was inspired to come up with his own variation on the concept, which he was able to put into production via the Southcott engineering firm for which he worked after the war. The first prototype was developed in 1954 and ran six separate heads. Dunstan immediately applied it to sporting pursuits, running to 68mph in the skiff Southern Maid. Before he could set a recognised Australian record, the boat disintegrated under the stress, leaving Dunstan's precious engine in 50 feet of salt water for a week before it could be recovered! Dunstan stripped, cleaned and rebuilt the engine and came up with a new, two-piece head that made 200hp on the dyno running nitromethane and 150hp on pump fuel while revving to a very unHoldenlike 7500rpm. Internally, the engine ran stock crank, pistons and rods, with a 12:1 compression ratio. Induction was by mechanical fuel injection. The downside? A lack of low-rev grunt, at least in normally aspirated form. A trip to see the Dunstan is well worth while. The thinking was that the engine could rev even higher and continue making power, but was limited by the durability of the pistons and rods. The rotary-valve head generated a lot of interest and it is thought around 30 were made in total, but few made their way onto functioning motors, Those that did fire up in anger saw. duty-on water, in circuit and speedway racing. The most successful application was by Bill Rowe, who fitted one to his Minx speedboat and regularly ran it to 800Orprn. The automotive version of the engine was, fairly involved. On a boat, chain drive could be taken from the rear of the crank, but for land use Dunstan had to devise a cast-aluminium timing cover and chain-drive assembly. According to the account in Wheels- of September 1957, Dunstan was working 'towards filing a DRV engine into 2 road-going Holden, with a standard Stromberg replacing the fuel injection. Rut he was frustrated by the. 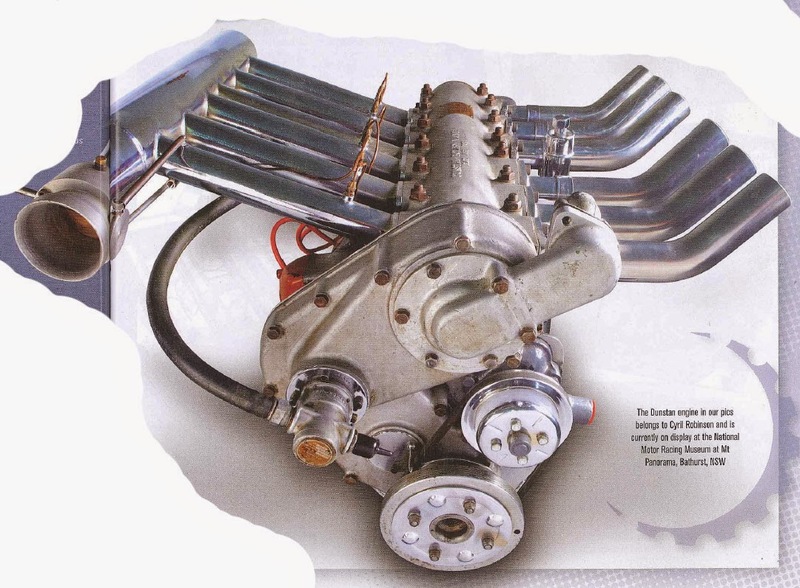 limitations of the Holden six and had plans to build his own engine, 139c.i. eight-cylinder mill arranged in two banks of 4 cylinders with a rotary valve on each bank, In road spec, Dunstan envisaged that his motor would make 100hp on regular fuel and rev to 12,000rpm, though 'le did use that a large-, race developer engine might make as much as 400 ponies — naturally aspirated. Sadly Dunstan died it 1958, about a year (the records am vague) after revealing his designs to Wheels, and the DRV engine died with him; but deep-thinkers around the globe continue to explore the concept. including Kiw Watson, who built and raced a special powered by a BSA based rotary-valve motor from the late 1980s. until 2001. Australia's Bishop Technology Group worked on a rotary valve for Llmor 'from tie late 90s until 2002 for use in Indy and F1 cars, Simulations showed that the design could support 30000rpm but in practice the single cylinder test bed struggled to run above 22,000rpm, idled at 6000rmp and lacked bottom-end torque. The project was shelved as F1 regs changed to V8s. 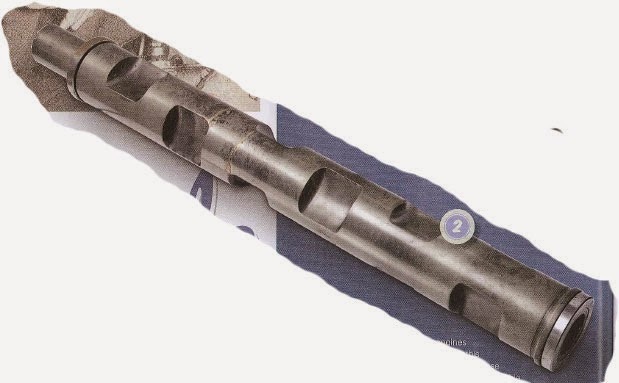 More recent developments, including pneumatically operated valves and bottom ones able to spin past 20,000rrpm, seem finally to have put the rotary valve idea to rest. Dunston fitted to Bill Rowe's Minx. then 6000rpm made the Minx difficult to control in turns! Dunstans engine may have been consigned, but Southcott Limited continues to thrive as a manufacturer of hydraulic equipment. The Rotart Valve itself was hollow and made of steel. It was lubricated by a petrol / oil mist, two-stroke style, but Dunstan has planned a pressure-lubrication system. The first circuit car to run a Dunstan engine was Murray Trenbirth's ex-F2 Alta, in 1958. It was later re-powered by another grey motor, this one topped with a Repco Crossflow head. ADELAIDE racer Dud Dansie bought two complete DRUB from Southcott for his BBM monoposto race car and ran it from 1959 and through 1960. The car was the subject of a feature story in Sports Car World of April 1960, which described it as running GMC supercharger and single Stromberg 97 cart and was said to have made 160hp on a 60 percent methanol blend. Backed by a Jag four-speed, the BBM was fast, covering the standing quarter in 15 secs flat, but had mixed results in racing, blowing an engine at one meeting and finishing fourth at another. By the end of the year, Dansie abandoned the experiment and fitted a conventionally-blown sideplate. And BBM? That stood for Bakewell Bridge Motors, where the car was constructed. These sorts of accounts of past engineering feats are gold. Bravo! I've had a bit to do with the Repco head in early years but as good as that was, it has none of the engineering that this does. Another one for the under resourced Aussie engineers of the day.